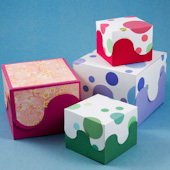 It's easy to make a collapsible square box with attached lids in just about any size and depth. In this project, you will create a custom pattern for a collapsible square box in the exact size to meet your needs. 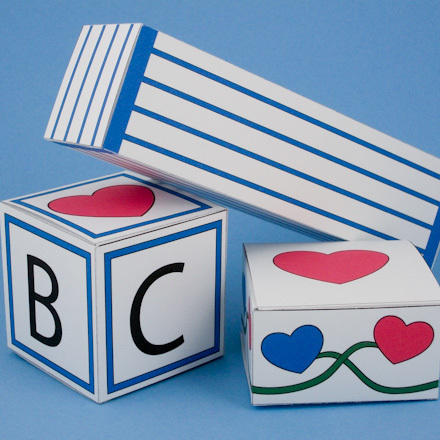 The basic box pattern is a strip of four rectangles or cubes with a glue tab at one end. The attached lids and box flaps extend from the sides of the strip. Draw the pattern directly on the cardboard for the box or make paper patterns that can be reused. Related craft: For printable collapsible square box patterns, see the Collapsible Box craft project. 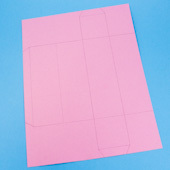 Optional: Computer or copier paper for pattern template. To determine size, you need to know the dimensions of the box you are planning to make. What is the size of the square of box's base? What's the height of the box? The pattern is based on a strip of four rectangles (or squares for a cube), which are the sides of the box. Draw a rectangle the height and width of the desired box. Draw three identical rectangles, with the height dimension adjoining, to form a strip of four rectangles. At one end of the strip, draw a beveled glue tab about ¼" to ½" (1 cm) deep. Draw the attached lids extending from either side of the third rectangle in the strip. The lids are squares that measure the box's width by width. Draw ¼" to ½" (cm) beveled flaps at the ends of both lids. The lids can also be drawn from opposite sides of the first and third squares. Draw beveled box flaps on both sides of rectangles two and four. 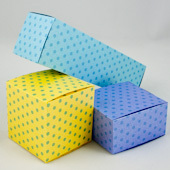 Transfer the pattern to cardboard, then assemble the box following the instructions in the Collapsible Box craft project. The left-most tab on the pattern is the glue tab. 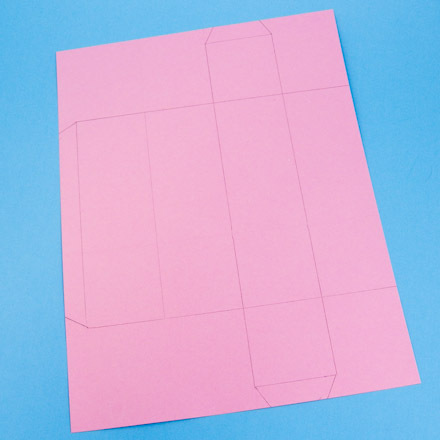 Tip: Before creating your own collapsible square box pattern, make one of the boxes in the Collapsible Box craft project using a printable pattern. 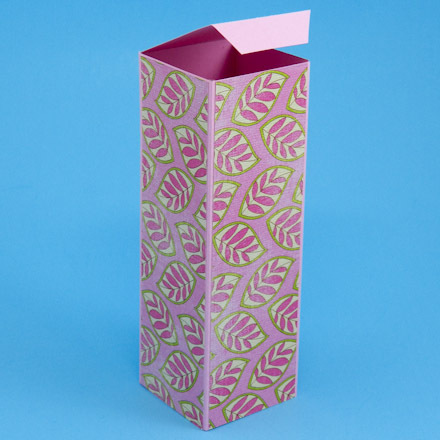 Tip: The example box is 2" by 6" and the pattern fills an 8½" by 11" sheet of cardstock. Strips of decorative paper were added to each side. 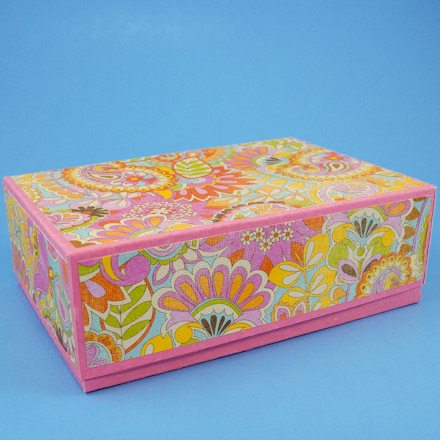 Tip: To make custom-size rectangular boxes with separate tops and bottoms, see the Custom Rectangular Box Pattern craft project. Tip: For a fancier box with custom pattern instructions, see the Interlocking Curves Box craft project.